As the handheld transmitter in our Synexis tour guide system, the Beyerdynamic Synexis TH8 delivers clear and precise spoken audio and maximum range, thanks to its strong transmission power: even without additional repeater equipment (which we will be glad to furnish), the transmitter commands a range of 100+ meters. 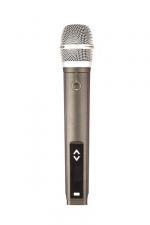 The device has an ergonomic shape and a cardioid-type microphone, ensuring that it rests comfortably in the hand while providing excellent voice pick-up from almost any speaking position. You'll be able to tell that Beyerdynamic comes from the recording studio tradition; they really know how to produce the highest quality microphones...even for tour guide systems. The tour guide systems we rent generally include batteries (at no extra charge). This goes for the Synexis TH8 tour guide system handheld transmitter too. Two 2,050mAh batteries provide 10 - 12 hours of operating time, which should be more than sufficient. Batteries can be charged in the tour guide system's Synexis C30 charging case. We'll also be happy to enclose a couple of replacement batteries upon request. Flip the switch near the bottom to turn it on, choose a channel using the channel-selector buttons (must match the channel on the receiver), and you're ready to go. There's also a mute switch, making it possible to block transmission of side conversations. Built-in elimination of pops and wind noise; the cardioid-type microphone ensures good intelligibility, even when the microphone is not in an optimal position. The Synexis TH8 handheld transmitter features the Softtouch surface, so it's really comfortable to hold. The shape prevents the microphone from rolling away when you put it down, and the body of the microphone fits the human hand ergonomically. The handheld transmitter's neck-strap (supplied) and its cardioid-type microphone make this possible. And it's pretty darn convenient to have your hands free when leading tours or giving presentations! Very few conferences and tours run for 10 to 12 hours at a stretch...but if the event may go on even longer than that, we recommend that you either request (free) replacement batteries with your rental or keep some standard AA batteries (the classic Walkman batteries) on hand. Yes, even AA batteries (like the blue ones from Duracell) provide the heart of our tour guide system with sufficient power. Very few of our tour guide systems can boast a range of 100+ metres. But the Synexis tour guide system can. Lost visitors? Conference participants out in the lobby who still want to listen in? Need director -> stage intercom functionality? No problem with the Beyerdynamic TH8 handheld transmitter. We support you around the clock, free of charge. Questions about a tour guide system you've rented, or about a technical upgrade, etc.? You can reach us 7 days a week at our regular office number, or toll-free at 0800/1188440. Press "1", and we'll connect you immediately with an expert technician. At Radio-Rental.com, we know the meaning of "support" and "service" – and we provide them without compromise. Of course, we also supply you with a complete manual for our Beyerdynamic tour guide system...and for our Beyerdynamic Synexis TH8 handheld transmitter, too. e.g. through trade fairs, museums or even through noisy industrial buildings. Renting a microphone stand is recommended for this application. When our Synexis stationary transmitters are used, almost any number of languages can be offered simultaneously. We'll be happy to provide you with detailed advice, based on our 20 years of experience, as you choose the perfect tour guide system for your intended purpose. Our consultation comes without obligation. If you'd like optional accessories, we ask that you let us know when requesting a quote (or when ordering your tour guide system).